Flavortext: "I don't think this is such a good place to start" will hopefully let people realize that the "start point" is not the upper left corner. Method: There are 3 nested sets of grids, and you work from the outside in. You start in the upper right corner with the hieroglyphics and go right to left, but you fill in the next grid from left to right. Hieroglyphics were usually written from right to left, so I thought that would make the puzzle more authentic and challenging. 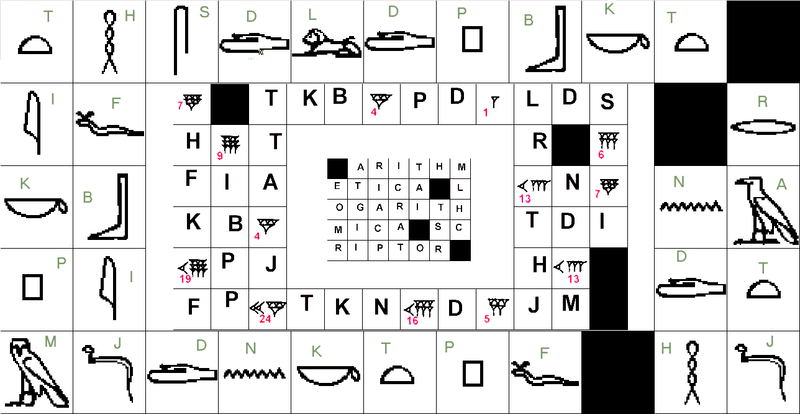 These are standard alphabetic hieroglyphics, and you can find them all over the web. The first symbol in the upper right is for T, so you fill in T in the first box in the upper left corner of the next grid. You translate the hieroglyphics into the English letters moving right to left, and you fill them in left to right. If you do it the right way, then the black boxes should match up. I recognize that there are some discrepancies with the hieroglyphic alphabet (some people might mistake the B for a V), but I think that there are only a few ambiguous symbols, and it would become apparent in later steps that something was supposed to be a different letter. The symbols in the middle grid are Babylonian numerals. People might recognize them or find them on the web. The Babylonian numeral system isn't that hard to figure out, though, so even if someone has no idea that it is Babylonian, hopefully they could count the little symbols and get "7" and so on. You use the Babylonian numerals to Caesar shift the letters that come after it. T shifted 7 is A, K shifted 7 is R, and so on. You fill in the new letters in the center grid (going from left to right). I suppose this would be the "aha" part of the puzzle. Once people figure out the symbols are numbers, I suspect they'll start using the numbers to modify the letters and realize that Cesar shifting produces something useful. Hopefully. The filled-in grid can be seen here. In the center grid, you should end up with "Arithmetica Logarithmica scriptor." Scriptor is latin for "author," and "Arithmetic Logarithmica" was one of Briggs' greatest mathematical works. If you google just "Arithmetica Logarithmica scriptor" you don't get anything useful. You have to realize that the words are Latin, and that scriptor is "author." Arithmetica translates only to arithmetic, and logarithmica doesn't translate. So the clue phrase is basically "Arithmetica Logarithmica author," which clues for Briggs.